A complimentary shuttle to shopping malls and sightseeing landmarks is available for guests, as well as free valet parking. Local excursions can be arranged at the hotel’s tour desk. Dubai Marina Mall, Ibn Battuta Mall and Emirates Golf Club are all within 10 minutes’ drive from JA Ocean View Hotel. Legoland and other theme parks can be reached in 25 minutes. Both Dubai International Airport and Al Maktoum International Airport are 30 minutes away by car. Please note that there is a mandatory New Year's Eve Gala dinner on 31 December 2018 is included for two adults only, the supplement for children or additional adults is not automatically calculated and it will be charged directly by the hotel as follows: - 12 years old and above: AED 1300 net per person. - 6 to 11 years old: AED 650 net per person. 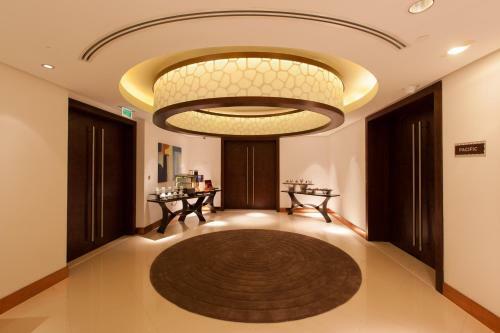 A security deposit of AED 500 is required upon arrival for incidental charges. All guests staying are required to provide their original passports upon check-in. For U.A.E. resident guests, either a passport or U.A.E. Identity Card is necessary to be presented upon check-in. The credit card must be in the name of one of the guests staying and the same card must be presented for verification upon check-in. If the guest staying is not the cardholder or for any reason, the credit card used cannot be produced at the time of check-in, the guest has to pay in cash or by alternate credit card for the booking. The hotel reserves the right to reject the booking due to non-compliance of the requirements. Please note that for flexible rates, the hotel reserves the right to pre-authorize the credit card anytime after the booking is made. Guests are required to show a photo identification and credit card upon check-in. Please note that all Special Requests are subject to availability and additional charges may apply. A damage deposit of AED 500 is required on arrival. You should be reimbursed on check-out. Featuring a balcony with a sea view, this modern, air-conditioned room offers free Wi-Fi. It includes a flat-screen satellite TV, a minibar and a wardrobe. The private bathroom comes with a bath and a shower and provides free toiletries. Featuring a balcony with open sea views over the Arabian Gulf and The Palm Jumeirah, this modern, air-conditioned room offers free Wi-Fi. It includes a flat-screen satellite TV, a minibar and a wardrobe. The private bathroom comes with a bath and a shower and provides free toiletries. Featuring a balcony with open sea views over the Arabian Gulf and The Palm Jumeirah, this modern, air-conditioned room offers free Wi-Fi. It includes a flat-screen satellite TV, a minibar and a wardrobe. The private bathroom comes with a bath and a shower and provides free toiletries. 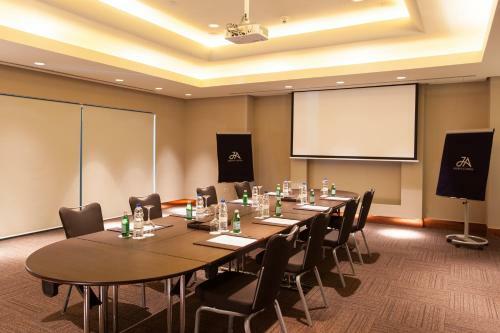 This room provides access to the Executive Lounge on the 24th floor and its associated benefits. Featuring a balcony with a sea view, this air-conditioned suite is modern and spacious. It has free Wi-Fi , a flat-screen satellite TV, a minibar and a wardrobe. The private bathroom comes furnished with a bath tub and free toiletries. Featuring a balcony with a sea view, this air-conditioned suite is modern and extra spacious. It offers free Wi-Fi and includes a living room with a flat-screen satellite TV. It also has a minibar and a wardrobe. The private bathroom comes with a bath tub, shower and provides free toiletries. 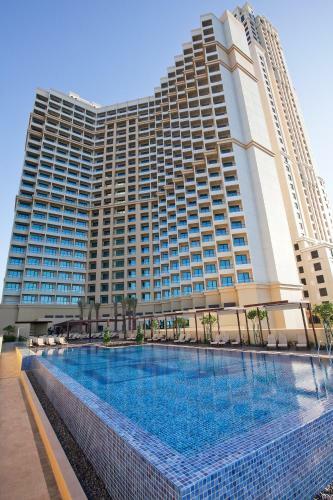 Featuring two interconnecting sea view rooms, the family rooms include family-friendly facilities and a bird’s eye view of the Arabian Gulf and Dubai’s famed Palm Jumeirah Island. Free WiFi is included.